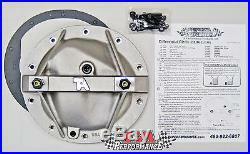 TA Performance Chevy 8.2"/8.5" 10 Bolt. Original Series Rear End Girdle. This girdle fits all Chevrolet and GM corporate produced cars and light trucks with 8.2" & 8.5" ring gear and 10 Bolt rear ends, including the Grand National and 1/2 ton trucks. TA Performance differential girdles are made from high strength 356-T6 cast aluminum and are precision CNC machined here in the USA. These girdles are specifically designed to strengthen the differential and add support to the bearing caps by means of the thick casting and reinforced crossbar. The crossbar contains two load bolts that apply pressure to the differential bearing caps to prevent bearing cap deflection under severe loads and acceleration. This greatly reduces or eliminates (in most cases) bearing cap fatigue and failure, one of the leading causes of broken rear ends. Each girdle is machined in-house using a 3 step CNC process which ensures the highest qualiy possible. Then each cover is hand deburred, inspected for the utmost in fit and finish, assembled, and packaged. We have been manufacturing our differential girdles for over 35 years and continue to offer the most widely used and respected girdle in the industry. We are proud to be the OEM supplier for Ford Performance Parts among other automotive performance companies. We also have a large network of dealers that are synonymous with racing and high performance parts. The best names in the industry rely on the TA Performance Rear Girdles. There are many copies of our patented differential girdle available on the market, but none are as strong and of high quality as ours. Don't put your rear at risk by using an imitation TA Girdle. Our differential girdles were the first and are still the best; insist on Genuine TA Girdles! By doing so you will also receive lifetime tech support from our expert service staff at TA Performance. Specifically designed to add support to the bearing caps under severe loads and acceleration, these girdles substantially strengthen the rear end. They also increase differential fluid capacity, which helps to lower the fluid temperature. All TA Girdles are made of 356 aircraft grade aluminum, heat treated to T6 specifications, and then stress relieved. All Girdles incorporate a Fill Port and a Drain Port with a Magnetic Drain Plug for ease of servicing. All Girdles incorporate 2 load bolts with swivel "feet" for supporting the bearing caps. All Girdles increase fluid capacity approx. All Girdles show a decrease in operating temperature, average of 15 degrees. This product is Brand New in the box, and comes complete with girdle, bolts, gasket, and instructions. We offer a Bearing Cap Stud Kit made by ARP. It replaces the four carrier bearing cap bolts with ARP studs, nuts, and washers. The studs are considerably stronger than the stock bolts. They locate the caps more accurately and draw down on them more evenly. This adds even more strength to your rear end. ARP makes these stud kits exclusively for us and are offered as a compliment to our Rear End Girdles. To add a stud kit to your order. Products are warrantied against manufacturing defects; damage caused by improper installation will not be covered. Listed by TA Performance of Scottsdale, Arizona. Specializing in Rebuild & Performance Parts since 1983. 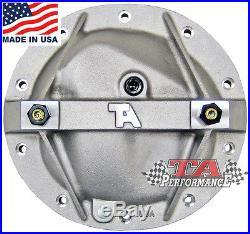 The item "TA Performance Chevy 8.2/8.5 10 Bolt Rear End Girdle Cover, Camaro Nova Firebird" is in sale since Friday, June 15, 2012. This item is in the category "eBay Motors\Parts & Accessories\Car & Truck Parts\Transmission & Drivetrain\Differentials & Parts". The seller is "ta-performance" and is located in Scottsdale, Arizona. This item can be shipped worldwide.